You don’t need to be a handyman to build a simple wall shelf. Building a shelf to add form and function to a room is a novice do-it-your-selfer’s dream project. You can use your shelf to display a treasured collection or to store cookbooks in the kitchen. A single small wall shelf consists of the shelf itself and brackets that are fastened to the wall. The shelf is either secured to the brackets or just rests on top of them. A wide shelf typically has at least two brackets fastened to the wall studs; more brackets are needed for longer shelves. Simple brackets are available at hardware stores or home centers, and a wide variety of decorative brackets are sold in all kinds of stores, catalogs, and just about anywhere household furnishings are available. Locate a wall stud and mark the location for the first shelf bracket on the wall. Then hold a shelf support bracket over the stud and use it as a template to mark the location of the mounting screws on the wall. For a low-tech approach to finding your stud, check at wall receptacles, removing the cover plate if necessary. There’s always a stud on one side or the other. Or remove the shade from a lamp and set the lamp with bare bulb about a foot away from the wall to highlight fastener locations. Or get down on your hands and knees and look at where the baseboard molding has nailheads showing. Wherever you see a nailhead, especially if they appear to be 16 inches apart, it’s likely that there is a stud behind it. Install the bracket with screws that are long enough to penetrate the wall stud by at least an inch or so. Mark the location of the second stud. Wall studs are usually placed 16 inches apart, so measure 16 inches from the bracket you just installed. Place a carpenter’s level on the first bracket to extend a level line to the second stud and then hold the second bracket in position. Mark the location for the second set of mounting screws on the wall. Install the second bracket with screws that are long enough to penetrate the wall stud by at least an inch or so. 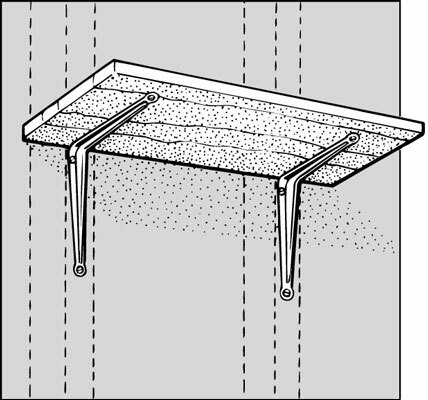 Install the shelf on the support brackets. Use short screws to secure the shelf to the brackets.